There are, in fact, two quite separate aspects to computer games; the software engine, and the artwork, including graphics, music, sound effects, cut scene video etc. Now, it’s true that the commercial value of game artwork depends to some degree on novelty of experience. Although gamers will continue to play a favourite game after they’ve clocked it (completed it), they’re unlikely to pay money for it again, and like blockbuster movies, bestsellers in the gaming industry tend to make the bulk of their money in the first wave of sales after the game is released. But if game software depended in any way of novelty experience, how could companies ever sell more than one commercial platform game, or top-down real-time strategy game, or first-person shooter? It’s true that the engines underlying genre games evolve, adding new features, improved realism, new gaming mechanics (a recent example is support for VR). But it’s also true that the “same game”, or at least its sequels and reboots, can be released years later, running on top of a completely different software engine. When gamers buy copies of big-budget commercial games, the software has to be included, but that’s not what they’re paying money for. The real commercial value is in the artwork, particularly the title, game world, story, characters, settings, and visual styles, a lot which is covered by trademarks as well as copyright. That’s why a company can make a top-down, real-time strategy game like Warcraft, then spin it off into an online, open world, 3D game using a completely different software engine (World of Warcraft), and still make bazillions in sales. That’s why it makes sense for a company like ID Games to throw the source code for the software engines of Doom and Quake “over the wall“, even while developing new games based on these popular franchises, using completely rewritten or even entirely new software engines. Groups making a bunch of different games in the same genre, requiring similar game mechanics, can collaborate on the underlying software engines. By pooling their development resources, they can improve the quality, and extend the capabilities of the software their games run on (”many eyes make bugs shallow” etc). At a deeper level, open source collaboration on engines can also lead to sending bug fixes and new features upstream as “patches“, to improve modules that are re-used in software engines, and other software components used in computer gaming. In an age of internet-connected gaming platforms (console as well as PC), being able to offer long-term support for game software actually increases a game’s commercial value (and its resale value). An open source development community supported by vendor-neutral for-benefit corporation (a “Foundation”, or a “Trust” in Commonwealth law), or a social enterprise, is more likely to be able to keep supporting a game engine into the future than game companies, which go bust and get acquired. Each game company benefits not only from the work of their own devs on the game engine they build games on, and the work of other game companies using the same engines, but the unpaid work of hackers improving the software as community contributors, and other software freedom supporters doing unpaid work to support the development of libre game software. Free code game engines under ongoing development are more likely to be cross-platform, which means the games built on them will automatically run on a a wide range of platforms. This, in turn, broadens the potential market for a game, and allows it game companies to focus their developers’ time on making great art and engaging gameplay, rather than having to spend time to “port” their game to every platform they think people might buy it for. I think it’s essential for the software engines to be free code, for all the usual reasons relating to user rights and protections. As a CreativeCommons advocate, I prefer games that at least allow free distribution, and I love the idea of games that license their art under a license that matches the spirit of their software license (eg GPL/ CC-BY-SA, or Apache 2.0/ CC-BY). I definitely support the development of libre games, and projects like the Liberated Pixel Cup. But I also think that *right now*, convincing companies to free their code (or use free code developed by others or both), and maybe use a CC license with a Non-Commercial and/or No-Derivatives clause for the artwork, is more realistic than convincing game companies to release their games as free culture, for two reasons. One, because as others have mentioned in a recent thread on the Trisquel forums, ARR (All Rights Reserved) artwork can’t compromise the user’s computer in the way proprietary software can, and two, because at least for now, it’s easier to make that case from the point of view of the companies’ interests. If we can prove its possible to build thriving game development businesses using free code game engines and non-free CC licenses, and that people who run those games on GNU/Linux and other free code operating systems will still pay good money for good games, we have a much better chance of convincing game developers that they will keeping paying even if the artwork if free-as-in-freedom too. Emma McGuirk, a woman I met through Permaculture in NZ Hui, recently submitted her doctoral thesis in anthropology, an ethnography of the growing timebank movement in Aotearoa, for which she has been researching and writing about the social nature of concepts like money, currency, trade, debt, and reciprocity. Over the five years we’ve been hanging out, I’ve read a number of books and articles she’s recommended about the nature and history of money, and I’ve been involved in many conversations about these topics, with a wide range of people. The funny things is, this is almost exactly how the first cash came about! As anthropologist David Graeber explains in his 2011 book ‘Debt: The First 5000 Years‘ (published the same year as Suede’s blog piece), rulers issued the first coins as a way of provisioning large standing armies, to extend their territory. To achieve this, rulers issued their soldiers metal coins, stamped with their own image (starting a tradition that continues to this day in many countries of depicting the head of state on coins), and then demanded their subjects pay them taxes in those same coins. Because people needed the coins to pay their taxes, they would accept them from soldiers in exchange for food, weapons, and other things the soldiers needed, without the ruler needing to do any central planning to organise for it (yes, in the absence of cheap, instant, long distance communication, markets are more efficient than governments). Then, for the same reason (needing ‘coin of the realm’ to pay taxes), people started accepting coins from each other in exchange for things of real value. It was only much later, when trust in rulers and governments was eroded by periods of political turmoil, that people got interested in what metals coins were actually made of, how “pure” they were, and whether they were valuable in themselves. So the central claim of goldbugs, that the gold standard came first and was was displaced by “fiat” (or government-backed) currency, turns out to be a myth. It misleads by telling only the very end of the story, as do the anti-semitic Jewish Banking Conspiracy myths of “goldsmiths” inventing centrally-controlled money, when they issued bank notes as promissory notes for gold. According to the historical record it was fiat currency and taxation that came first. Goldbugs came later, followed by banks and banknotes. Incidentally, Graeber also debunks the economist myth that money was invented to solve the problems of barter, when he points out that barter is only found in the historical record in periods where government-backed currency systems have broken down, and people have forgotten they can just share their surplus without recording the exchanges in obsessive double-entry accounting systems (pioneered by Muslim civilizations in the 600s AD but formalized in Europe almost a thousand years later). What this illustrates is that in a society where people want to trade on a larger scale than they are willing to trust and share, a stable currency is a public service provided by a government. A single unit of any currency isn’t inherently worth anything. People work out its value by figuring out what other people are willing to exchange for it in a market, given the limited quantity they can obtain over a given period of time. In other words, as Graeber puts it, the value of money is a “social agreement”, and the same is true of the value of gold and BitCoins. Now, unlike a lot of suspicious and technically illiterate goldbugs, I agree with Suede that BitCoins are reliably scarce. Everyone who runs the software agrees not to switch to a fork of the software that would allow an increase in the maximum number of coins (ie a social agreement), and it’s self-evident that allowing an infinite number of coins would make the whole cryptocurrency exercise pointless. But that scarcity is not fundamentally why a BitCoin has value. IP addresses are scarce too. There are a finite number of IP addresses that can connect over the open internet (about 4 billion in IPv4, increasing to 3.4×1038 with IPv6), and being the gateways to the global network gives them inherent economic value, but nobody is proposing to use IP addresses as money, or offering anyone thousands of dollars to buy one. Being scarce is not always good either. Although a currency can lose value if there’s too much of it in an economy, relative to the amount of goods and services available to buy with it (”inflation”), if it gets too scarce, people will eventually agree to start using more available things as currency. 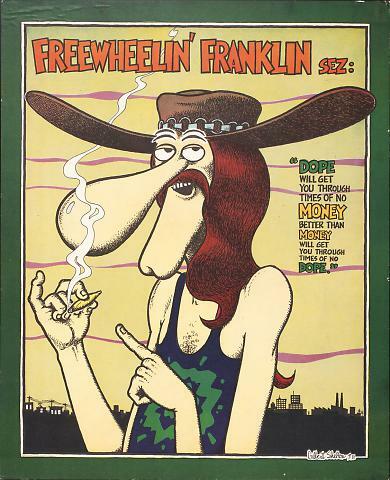 As Freewheelin’ Franklin of the Furry Freak Brothers is infamous in stoner circles for saying “dope will get you through times of no money better than money will get you through times of no dope”. Ironically, I think the shortage of circulating currency caused by the economic policies of austerity (also know as “monetarism” or “neo-liberalism“) is one of the reasons there are so many goldbugs around these days, along with a growing and mostly justified distrust of contemporary governments (most of whom continue to push austerity policies despite all the evidence it’s amplifying, if not causing, the problems it claims to solve). The bottom line is that a BitCoin is valuable for the same reason gold is valuable, despite being mostly useless for buying stuff, because some people will agree to exchange it for fiat currencies. Fiat currencies are valuable because people will agree to exchange them for useful stuff, because people need the fiat currency to pay taxes, just like when it was invented. Everyone implicitly agrees to pay taxes in fiat currencies by not agreeing to have a revolution, and find another way to fund the social functions currently overseen by governments, including ensuring the stability and reliability of the everyday currency. In other words, it’s valuable because of a complex web of social agreements, some of them with deep historical origins. Suede claims in his blog piece that gold and BitCoins are suitable to serve as money because they are “something tangible, fungible, and divisible” and therefore fit the Austrian school criteria for a “commodity” (not to be confused with the marxist concept of “commodification” which is related but different). But saying that money should be a commodity (by the Austrian definition) ignores a number of other aspects of the way it actually functions, particularly the ‘velocity of money’. If I put a dollar under my mattress for a year, at the end of that year it’s served as one dollar for that year. But if I spend it in January, and then the person I paid it to spends it in February, and it continues to be spent once a month for the rest of the year, then by the end of December, it’s effectively served as $12 for that year. So the amount of money in a given economy at the end of a year is determined not just by the amount that was present at the start of the year, but also by how many transactions each unit of money facilitates over the course of the year (and also how much money banks have loaned into existence as mortgages that year but that’s another story). What other “commodity” becomes more plentiful as it gets used? Isn’t the whole point of using a commodity as money that it’s scarce? The only other thing I can think of that grows as it’s used is the seeds exchanged in seed-saving networks, which is interesting. Could seeds be the basis for a sane currency? One that grows at ecological rather than exponential rates? Unlike gold and BitCoins, they actually do have inherent value, you can grow food from them and in some cases, push come to shove, you can eat them. Another possible basis for a sane currency would be energy supplies. Since no economic activity is possible without energy, it also has inherent economic value. In fact, economist Jeff Rubin argues that internationally, existing currencies are effectively backed by fossil fuels (particularly the US$, see the hilarious explanation of petrodollars by English comedian Rob Newman), and that the plateauing of global oil extraction rates around 2005/06 was one of the underlying causes of the global financial crisis in 2008. It could also explain why the US economy has been stagnant since the oil shocks of the 1970s, after its domestic oil extraction rate peaked in 1970/71, and why the economy of Venezuela, which depends almost entirely on oil exports, is rapidly going to the dogs. It could even explain why inconvenient facts about the contribution of fossil fuels to climate change and the inevitability of peak oil (sooner or later) continue to be loudly denied by a network of self-proclaimed “skeptics”, most of whom have or are funded by major investments in business-as-usual, and not just in the fossil fuel industry itself. But if Rubin is right, and the commodity that backs the world’s currency systems is in decline, could we create a new currency system backed by renewable energy? SolarCoin are experimenting with this by issuing cryptocoins to people generating energy using solar technology. Certainly worth considering, if only as a thought experiment to help with understanding just how convoluted this money stuff can get. Exactly. Ironically, in the next paragraph Lingham references the goldbug Just-So Story of money’s origin bebunked by Graeber (see above), so while he’s not wrong that stabilization of value is necessary precondition for BitCoin to become a ‘medium of exchange’, his explanation ignores that people will continue to accept fiat money as currency, even when its value become volatile, as long as they continue to believe the government can guarantee its usefulness for paying taxes and settling debts. I recently responded to a comment on the Loomio group for Commons Transition, proposing the establishment of a commons-orientated body for digital technology standards, and decided my response was worth tweaking into a blog post. In short, my thinking is that standards bodies are already part of a commons, they are participatory governance mechanisms for shared technical commons. To propose a new, commons-specific, standards body, is to fundamentally misunderstand the nature of standards, what they are, and how they come about. All new work on future standards starts somewhere, often inside an organisation or group of organisations working on the bleeding edge of a new area of technology, but to be widely adopted, a new standard must be approved by a standards body that already has buy-in from a broad range of relevant actors. There’s a classic XKCD comic on standards proliferation that sums up the problem nicely. The same logic applies to the proliferation of standards bodies, and really any other case of reinventing the wheel. Let’s keep in mind here we are talking about engineering standards. Such standards, and the bodies through which they are developed and formalized, have to do their best to be ideologically neutral, and focus on provable technical criteria, because the whole point of them is to coordinate activity across a the broadest possible cross-section of the actors who trying to implement a common (inter-operable) system. the corporatist way: standardization could be “left to the market”, with all the companies involved in the electricity sector doing everything in their power to force their competitors to adopt their preferred ways of doing things, thus giving them a first-mover advantage. But this tends to result in competing systems that don’t inter-operate for years or decades, resulting in uncertainty and inconvenience for both businesses and end users. the statist way: standards could be dictated by government, obliging any company operating in that government’s jurisdiction to follow one set of standards. But this doesn’t solve any problems involving inter-operation of systems across state borders, and government couldn’t do a good job of it without doing extensive consultation with engineers and designers anyway. the commons way: non-governmental and non-commercial standards bodies are set up as independent organisations, inviting participation by engineers from as many different organisations as possible, who proceed towards consensus, via discussions focused on measurable technical criteria (eg does it work? Is it safe? Is it efficient?). Once these cross-industry consultations reach consensus on a standard, most industry actors will implement it voluntarily, understanding that the benefits of inter-operability outweigh the those of sticking to their preferred way of doing things, and knowing that their engineers can continue to make their case in discussions on the next version of the standard, or a new standard that might one day displace it. However, governments may also make some parts of the standards compulsory in their jurisdiction for public safety reasons (eg standard voltage for household wiring and appliance to prevent house fires from non-standard voltages clashing). One way to think of standards is as peace treaties between businesses competing in the same industry. Standards bodies play a role analogous to the role played by inter-state treaty bodies like the UN or the WTO. There would be very little point in group with a shared political-economic ideology sitting down and defining their own standards for electrical systems, because there’s absolutely no reason for anyone outside their group to implement such standards. It would be a bit like all the Buddhists in anglophone countries sitting down together to negotiate treaties between their countries. In both cases, either they would be ignored, or if they came up with something useful, it would still have to be run through the relevant standards bodies/ treaty organisations anyway before anyone outside their group would take it seriously. I’m not saying it’s not worth gathering people in a new forum to discuss possible new standards (or new treaties), indeed nothing new would be possible if nobody did. What I am saying is that it would be a mistake to see this as something fundamentally new, rather than one of the traditional ways of participating in the standards process. Update 2018-04-18: A new concept in the right to repair movement is the concept of “Repair Cafes“, some of which take place in existing Makerspaces/ Hackerspaces/ FabLabs and Men’s Sheds, while others are making use of school workshops and other educational spaces. Today I came across a MotherBoardTV article today that really sums up just how deep the software freedom rabbit-hole goes. It reports on US farmers jailbreaking their John Deere tractors with reverse-engineered firmware. Why? In defence of their right to repair their own tractors, or take them to a local mechanic, instead of having to wait for service from an official John Deere approved service centre who could be miles away and take days to get repairs done. This may sound like something out of a dystopian science fiction story, but it’s happening right now, and it’s a classic example of why software freedom isn’t just a fringe issue for GNU/Linux geeks. The question underlying the concept of software freedom has always been about whether we really own the things we buy (including the rights to repair, tinker, modify etc), or whether we actually only buy a license to use them, under terms that are approved by the manufacturer and subject to change by them at any time. As more and more household, commercial, and industrial equipment becomes computerized, and is connected to the internet (leading to the new buzzphrase “Internet of Things“), the answer to this question affects more and more people. Now, as farms become computerized, it’s even affecting farmers, a group for whom the freedom to tinker with and repair the many pieces of farm equipment on which they depend has traditionally been crucial to keeping their costs below their income. The tractor-hacking farmers are just one example of a global ‘right to repair’ movement that has been gaining steam in recent years, made up of local groups involved in Makerspaces/ Hackerspaces/ FabLabs and the Men’s Sheds, advocacy organisations like Repair.org (mentioned in the tractor article), and community collaboration sites like iFixIt.com (who host repair manuals for a wide range of hardware under a CreativeCommons BY-NC-SA 3.0 license). Aside from citizens’ rights of ownership of their own belongings, the right to repair also has serious environmental sustainability implications. The Swedish government recently enacted a tax breaks scheme on repair activities to make it more economic to repair things rather than buying new ones, with the goal of encouraging people to reduce avoidable waste. This is a positive step, but it’s benefits will be limited if corporations are still allowed to erect a fortress of legal obstacles, using things like copyright law, patent law, or contract law through restrictive EULAs (End User License Agreements), to hamstring local repair and modification operating independently of their supply chain. This may be the purpose of the infamous “as such” exception to the rule against software patents in the 2013 update of the NZ Patents Act (disclaimer: I am not not a lawyer). For example, it could be argued that embedded software in a computerized tractor is not really computer software “as such”, which means it’s possible that patent law could still be used against groups offering free code alternatives to proprietary tractor software. The most likely target for legal action, considering the commercially-orientated nature of patent law, would be local tractor mechanic businesses who use that free code software to help farmers keep their older equipment working. Patent law supposedly encourages progress in the arts and sciences. It’s truly horrifying that it could be used in such an anti-environmental and anti-competitive way, obliging farmers to buy new equipment when they don’t really need to and potentially forcing rural mechanics out of business. It’s essential that legislators and regulators make the effort to understand these the implications, and act in defence of the the right to repair.